I didn’t inherit any fragrant plants when I took on my garden and I’ll admit scent hasn’t been given enough priority when I’ve been out plant buying. My tastes and ideas have changed from the fairly inexperienced gardener I was eight years ago and I’ve learnt a huge amount in that time, not just about plants but also my own tastes and the type of garden I want to create. Up until we moved here I had gardened mainly in pots to accommodate our frequent moves and the fact that we were renting. Container gardening was a brilliant way to assuage my need to grow, but it’s quite a different discipline to growing in soil and planting with a sense of permanence. Many of my ideas now are driven by my love of cutting plant material to bring indoors to fill vases, and scent is playing an increasing role in these choices. Along with Sue at Backlane Notebook I’m hoping that a ‘Scent in the Garden’ meme will encourage a focus on scented plants, will make me look at this extra dimension to my garden and will uncover some fantastically fragrant plants over the coming months. For the February instalment of the ‘Scent in the Garden’ I have both Viburnum x bodnantense ‘Dawn’ and Viburnum tinus flowering, as they have been since the end of November. The freezing temperatures haven’t been enough to discourage the winter-flowering honeysuckle from blooming. 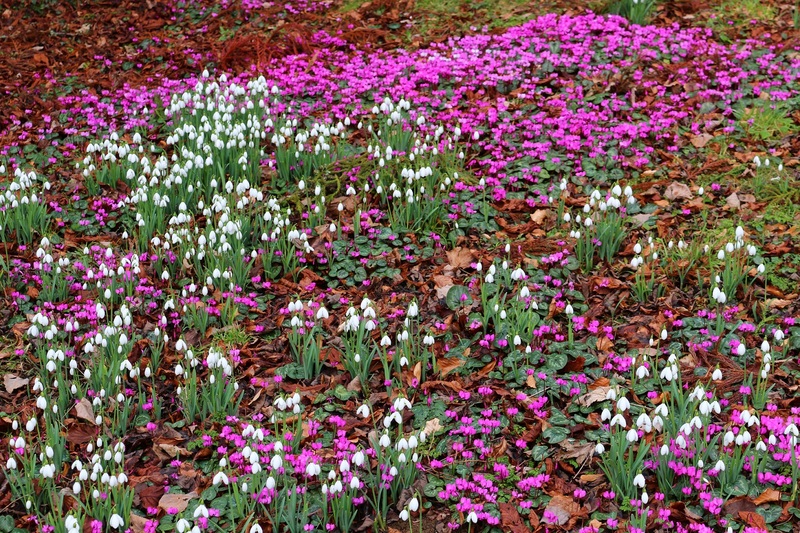 It has a tendency in very cold weather to retreat and withhold new flowers until the weather warms up. 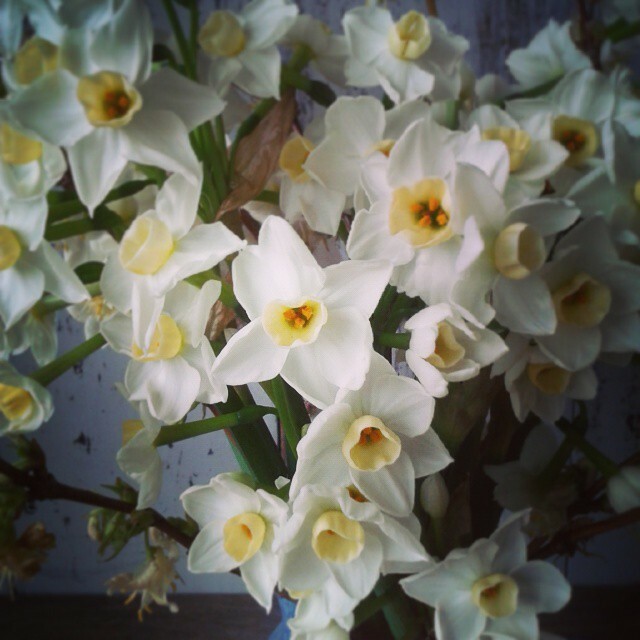 A few stems have provided a lovely addition to some stunning Cornish scented narcissi, which are a far superior Valentine’s Day gift than any red rose. As for new appearances, there’s sarcococca, or winter box, which smells fabulous. It was just coming into flower in mid-January, but now it is in full bloom. It’s planted by the path which leads from the gate to the front door, so wafts of scent fill the air as you pass by. 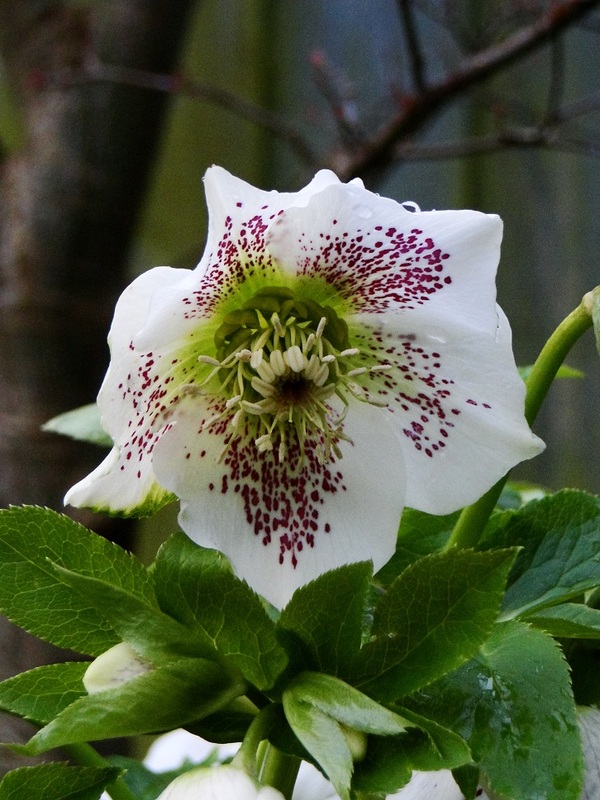 It’s a relatively new addition to the garden at just two years old and it is still quite small, so at the moment the air needs to be still and relatively warm for the fragrance to come to the attention of your nostrils, otherwise you need to bend down. A garden in the village has two sarcococca plants about a metre high which I covet. They are currently pumping out their heady perfume which means you can smell them well before they come into sight. One day that will be the scene in my own front garden. 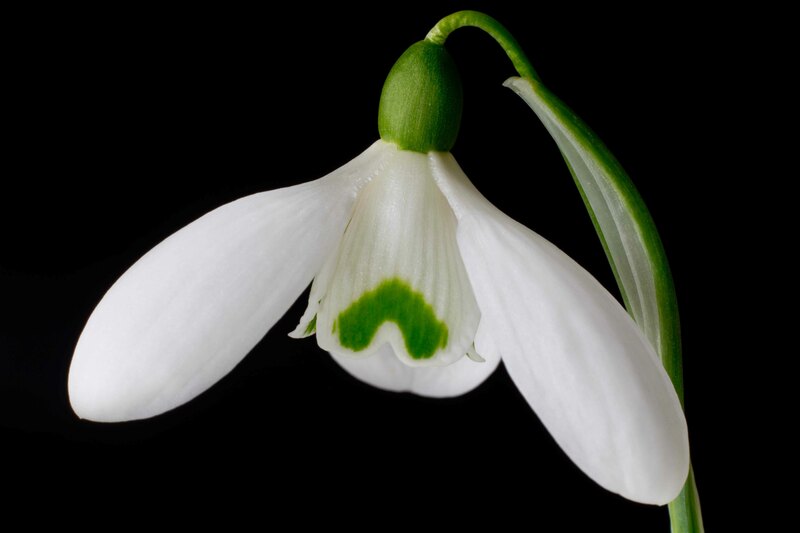 In terms of scent, one of the biggest revelations for me in recent years has been the discovery that certain varieties of snowdrops are deliciously fragrant. 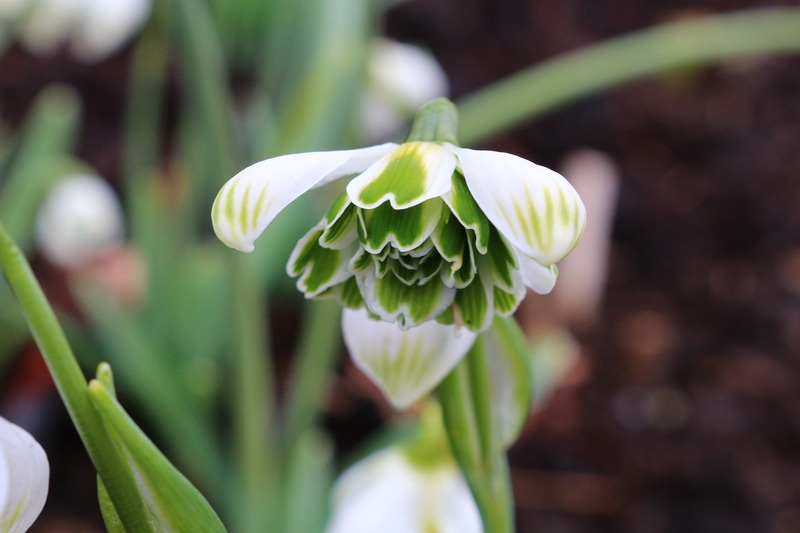 Most of the snowdrops in my garden are the common snowdrop, Galanthus nivalis. It’s a great variety – easy to come by, fairly inexpensive and it bulks up readily to form good-sized clumps, the one thing it lacks is scent. 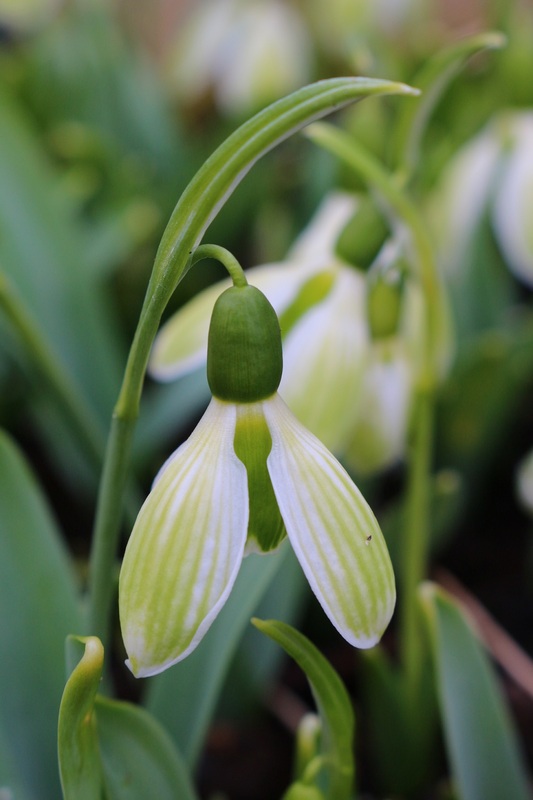 I had heard of snowdrops which smelt of honey, but it was only this year, when I attended a talk by the author and snowdrop connoisseur Naomi Slade, that I had the opportunity to sniff a selection of snowdrops. 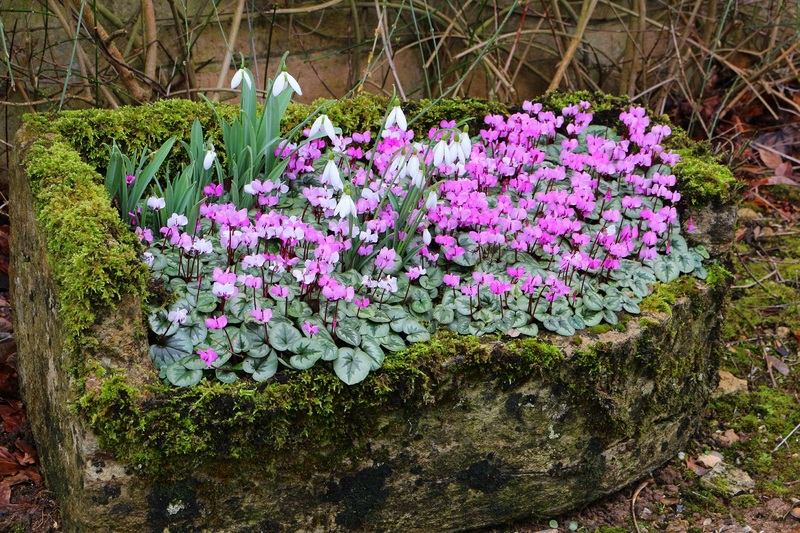 Naomi had brought with her a collection of snowdrops in pots to illustrate the different forms – those with short, strap-like leaves, flowers with layers of petals like a ballerina’s tutu and tall-stemmed blooms with large, nodding heads. As the pots were passed around I smelt each one and made a note of those with the surprisingly potent perfume. ‘S. Arnott’ was the variety which stood out and it immediately went to the top of my must-have plant list. I probably shouldn’t be making plant purchases until we’re settled in a new garden and I was about to resist the temptation of the plant stand at a recent visit to Colesbourne (more of which in a later post) when Wellyman encouraged me to make a cheeky purchase. He can be quite a persuasive influence when it comes to plant nurseries, but, to be honest, it doesn’t take much to break down my resistance. So here is the latest addition to the scented garden. It’s an exquisite flower and hopefully one day, in the not too distant future, I’ll have enough of clumps of ‘S. 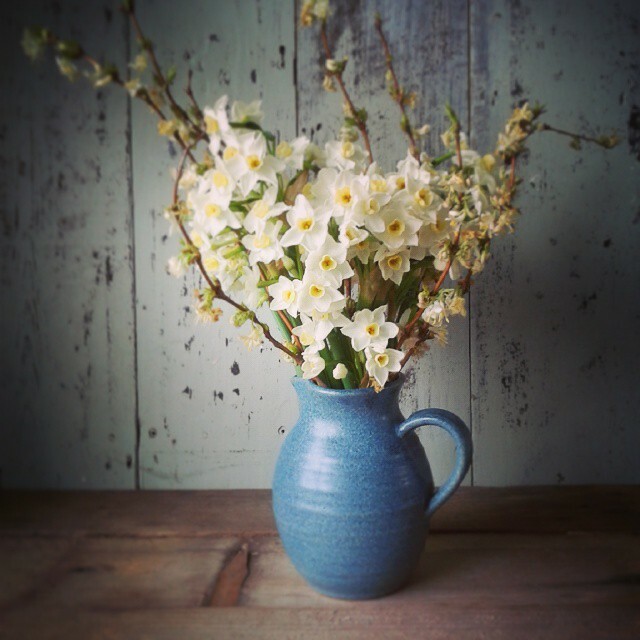 Arnott’ so I can pick a few tiny nosegays of snowdrops to bring indoors. Slowly but surely the garden is emerging from its winter slumber. 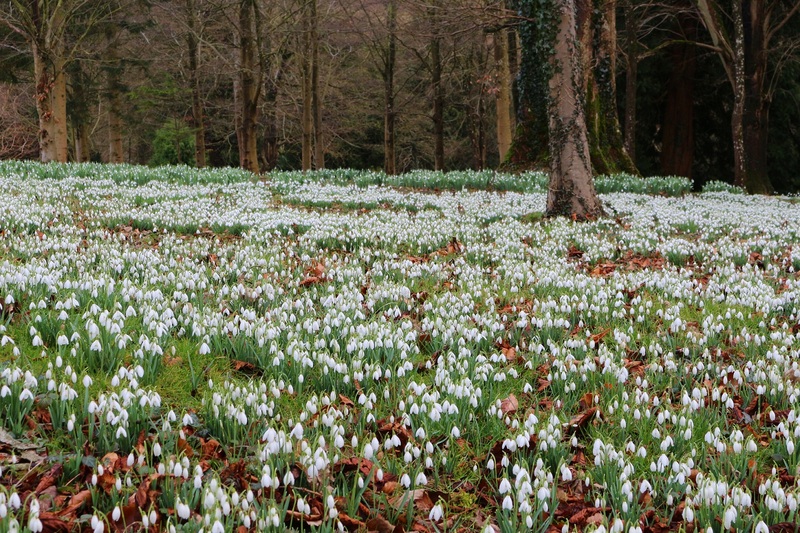 On gloomy, grey days the nodding heads of snowdrops glow; on gin-clear days they sparkle and glisten. Hellebores hang their flower heads as if they are too shy to display their beauty. The slender green shoots of crocus bulbs are appearing. One lone crocus is ahead of the pack, its buttermilk-coloured petals opening to the first hints of warm sunshine. I, too, am experiencing a reawakening. I feel a bit like a bear poking its head out of its winter hibernation home, sniffing the air, rubbing its eyes and deciding whether it’s warm enough to emerge yet. Up until Sunday I would have said no. If I was a bear I’d have retreated inside, had a good scratch and eaten lots of marmalade. That’s what bears do, isn’t it? As I’m not, I put more logs on the fire, I read, I crocheted, I wrote and I ordered seeds. Too many seeds, as usual. Then it was if that first tantalizing hint of spring arrived. Sunday was a stunner. Crystal clear skies and warm sunshine. Well, when I say warm it was 8⁰C, but that felt positively tropical now there was no north wind to add windchill to the freezing temperatures of the previous week. After weeks of wondering whether my garden mojo would return I was outside filling seed trays with compost and preparing for the first seed to be sown. The compost was cold. Cold enough to make my fingers numb. No seed would be encouraged into life in this, so the seed trays and modules have spent the last few days warming up on the heated propagator and near a radiator. It’s imparted an interesting smell to the kitchen, but hopefully it has created a much more welcoming place to sow my seeds this week. There’s a lot written at this time of year about whether to sow or not. Most of us are so eager to start growing. The conditions aren’t ideal yet for many seeds and sowing too early can lead to problems later on with a backlog of plants too big to look after indoors but it’s not quite warm enough for them to be planted outdside. Some plants however do need an early start. They can be slow to germinate or just need a long growing season to do their thing. 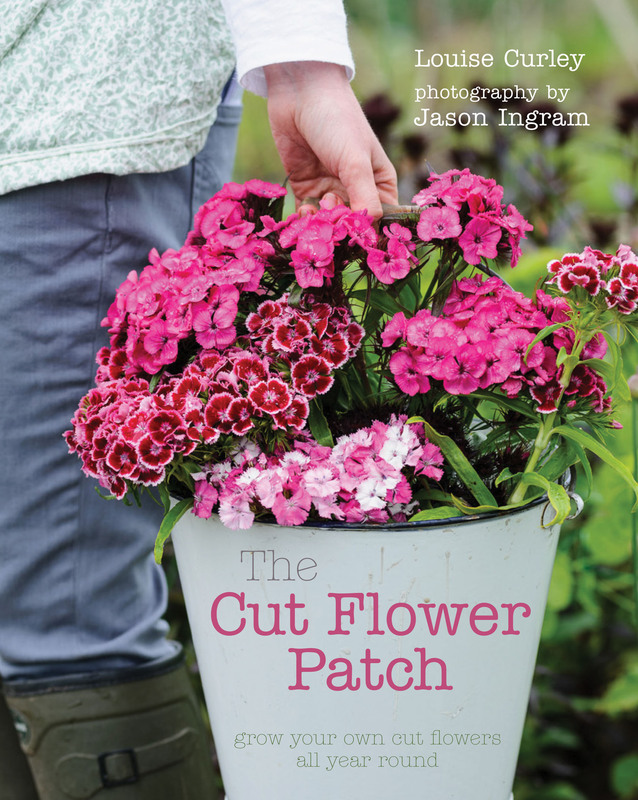 For me this includes flowers for my cutting patch such as ageratum, statice and antirrhinums. Any plants which say on the packet they will flower in their first year from an early start are worth sowing in the coming weeks. 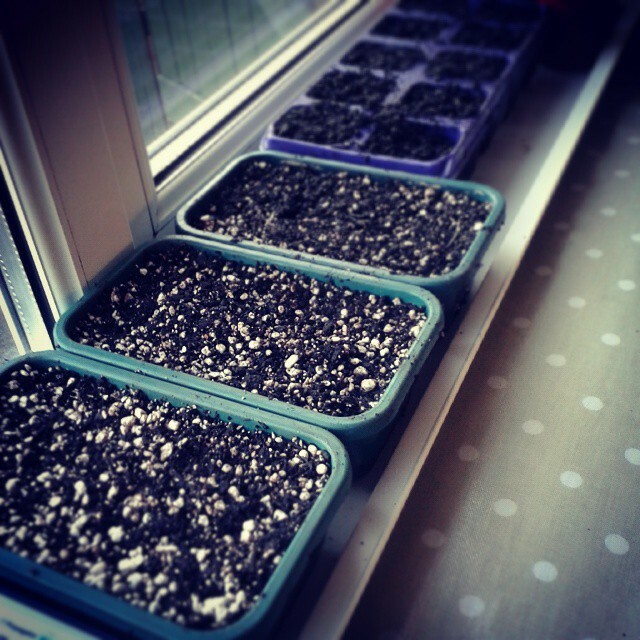 They’ll need a bit of warmth in order to germinate and as much daylight as you can give them. But, as we’re only six weeks away from the spring equinox and seven weeks from the clocks going forward, light levels are definitely improving. I also like to get sowing now as I know how frantic March can be. I have limited space so starting off some plants now is one way of staggering the seed sowing demands on the horizon. 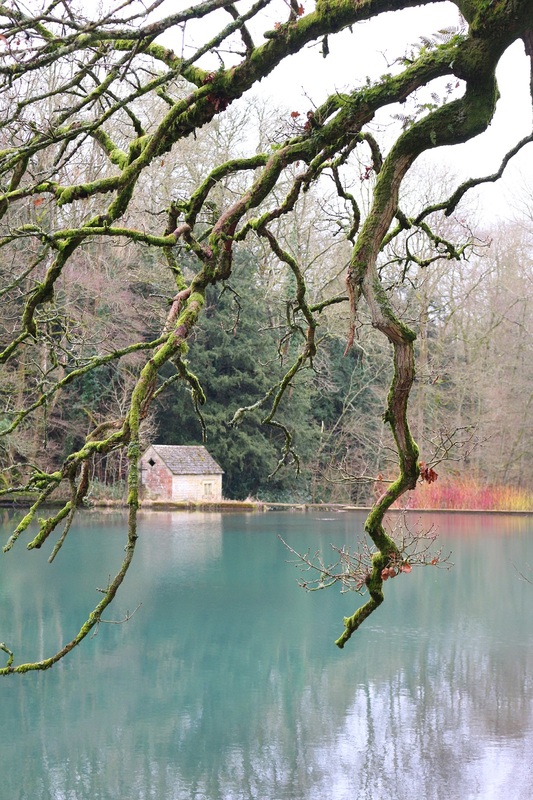 Obviously a few sunny days in February doesn’t mean we can shake off winter just yet – as I’m writing this post, the gloom of winter has returned, with an impenetrable grey sky looming over head. But I’m going to embrace the last few weeks (hopefully) of winter and savour any time in front of the fire. 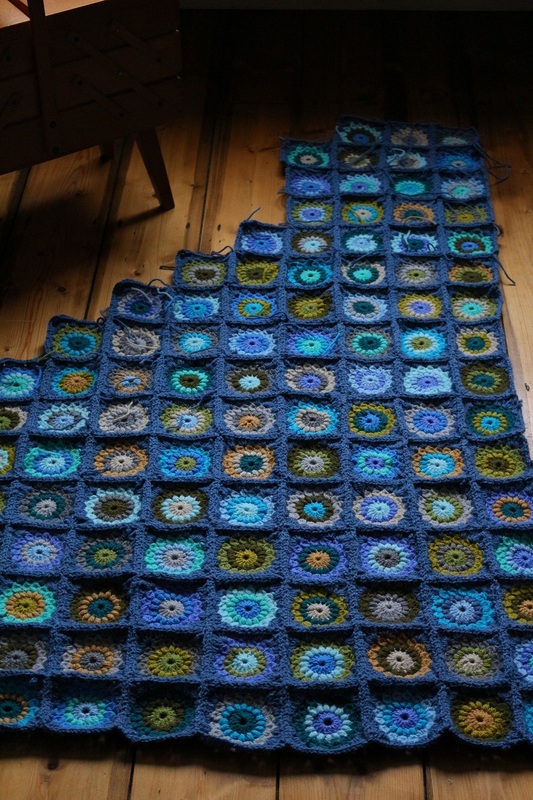 My winter project – a crocheted granny square blanket – is nearly completed. It’s been an epic. All 208 squares are finished and I’m in the process of stitching them together. Then I just need to edge it with a border. The aim is to complete it for the start of March. I hate having unfinished projects lying around, so I know it needs to be completed before the garden grabs my attention. One of my New Year’s Resolutions was to read in my lunch break. As work has been a bit crazy over the last few weeks (the pattern of freelance work is very much like the frequency of buses) my utopian idea of reading every day hasn’t come to fruition. 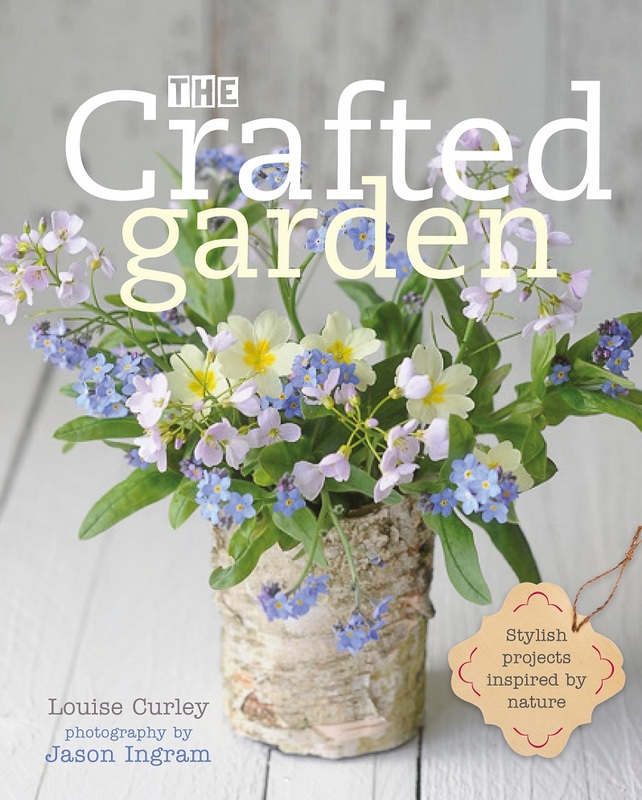 But my resolution hasn’t been a complete right-off and I have managed to devote some time to this gem of a gardening book. 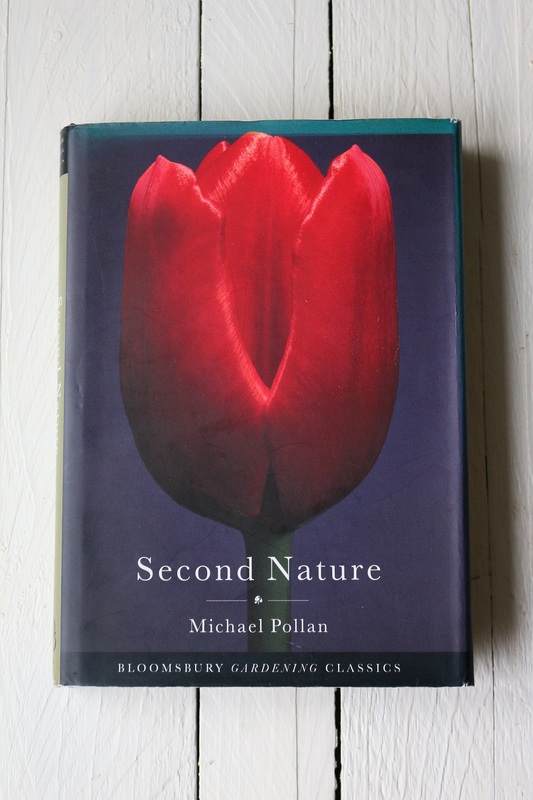 Second Nature by Michael Pollan is a fascinating and wittily written book by this American author. It’s worth reading simply for the hilarious description of his war with a woodchuck which sets up home in his garden – I laughed so much I snorted my tea. One of the benefits of working from home is that nobody saw that moment of inelegance. 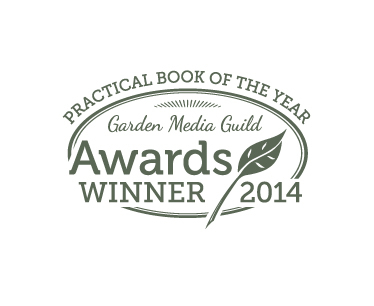 The book is full of deeper, thought-provoking ideas too – our love of roses, a gardener’s relationship with trees and man’s desire to tame nature – with each chapter following the creation of his own garden. I would heartily recommend reading it. Stop drinking your tea though when it comes to the woodchuck bit.